Overall 22 AmChams with approximately 40 representatives from AmChams in Europe and wider Europe participated in the Brussels Briefing. 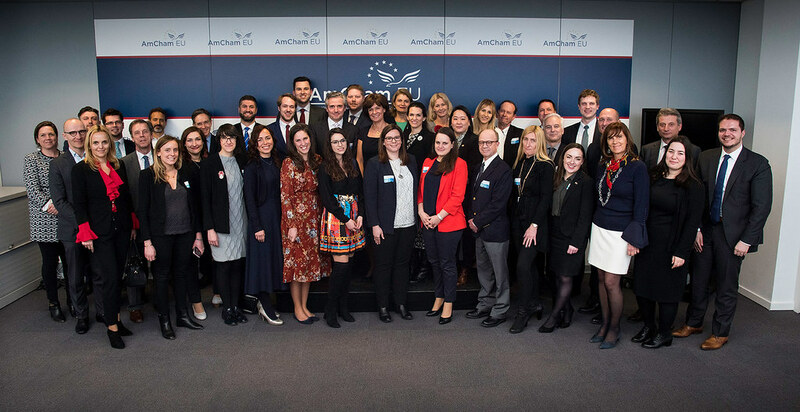 As in previous years, the briefing coincided with AmCham EU’s Transatlantic Week, including the Transatlantic Reception on Wednesday, 20 March 2019 and the Transatlantic Conference on Thursday, 21 March 2019. Transatlantic Week also saw the launch of the 2019 edition of the Transatlantic Economy Report commissioned by AmCham EU and the US Chamber of Commerce. AmCham EU would like to thank the supporting partners of the study: AmCham Denmark, AmCham Finland, AmCham Ireland, AmCham Slovenia and AmCham Sweden. The Transatlantic Economy Report presents the most up-to-date facts and figures about the EU-US economic relationship. AmCham EU has also launched its new online platform, ThrivingTogether.eu, which demonstrates the strong ties Europe and the United States share. Brussels Briefing emphasised the importance of the AmChams in Europe network and in particular the policy coordination among the chambers. The programme included several sessions on many policy areas covering Brexit, digital policy, digital tax and single-use-plastics. A panel on transatlantic relations featured speakers from the European External Action Service and the US Mission to the EU. Other highlights included a panel on the EU elections and a closing lunch with Ann Mettler, Head of the European Political Strategy Centre (EPSC), moderated by the Chairman of AmCham EU, Maxime Bureau. Overall, the briefing provided a great opportunity to exchange ideas and best practices among the Chambers and to plan more joint advocacy. For more information please contact Jelena Letljane (JLE@amchameu.eu).